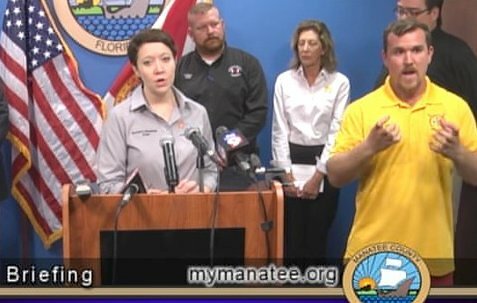 As Hurricane Irma was racing toward Florida, officials in Manatee County, which is immediately south of St. Petersburg, hastily pulled together a news conference to explain mandatory evacuation orders. “We just need you to be safe,” Robin DiSabatino of the Board of County Commissioners said at the briefing. She went on to lay out the basics for critical evacuation guidelines. Unfortunately, deaf and hard-of-hearing viewers received very different instructions through the interpreter. It quickly became apparent that the interpreter, who appeared unsure of himself, was not a qualified professional. Sure enough, it turned out that he was actually a county lifeguard who has a deaf sibling and was pulled into the conference at the last minute. Video of the news conference has received more than one million views on YouTube. Julie Beacham-Hooie, a deaf resident of Manatee County, told the Times that the failure to provide a qualified interpreter added considerable anxiety to the situation. A spokesperson for the county told media that the lifeguard was asked to sign because they did not have time to find a qualified interpreter in advance of the news conference. The goal here is not to embarrass “The Lifeguard in the Yellow Shirt,” as he’s come to be known. He was surely making his best attempt. The commenter is correct. The larger point is that at a time of crisis, deaf and hard-of-hearing lives were put at risk due to the county’s lack of preparedness. The poor signing highlighted the danger the Deaf and Hard-of-Hearing community faces in emergency situations when interpreters are used who do not have the right qualifications or accreditation. Government agencies should take this opportunity to reflect on their preparedness to communicate with the Deaf and Hard-of-Hearing in a similar scenario, as giving incorrect information during a disaster could have had deadly consequences. This is a risk-management issue that covers compliance, as well as the safety and property of those who did not get equal access to disaster information. Furthermore, not having a qualified interpreter – and therefore not providing the Deaf and Hard-of-Hearing with necessary information during an emergency – is a violation of the Americans with Disabilities Act. Communities that do not fulfill this requirement are out of compliance and put themselves at legal risk. The lesson here is that all governments need to be prepared in advance to have a qualified interpreter. They must have professional American Sign Language interpreters lined up and available rather than scrambling at the last minute and using the relative of someone who is deaf. Communication with the Deaf and Hard-of-Hearing communities – which combined are 48 million strong – should not be an afterthought. LanguageLine can help. We are able to provide qualified onsite and video American Sign Language interpretation in the event that your community faces an emergency and must communicate with the Deaf and Hard-of-Hearing.